For the first time, Tesa cigars can now be purchased at a location other than Tesa’s shop in Chicago. Starting on Friday, Riverside Cigar Shop in Jeffersonville, Indiana, began carrying Tesa’s “ultra-boutique” cigars, and the tobacconist kicked off its new relationship with an event featuring Chris Kelly, owner of Tesa Cigars. I recently exchanged text messages with Kelly about this development, inquiring if an even larger distribution of Tesa is in the works. He did not rule out the possibility of more tobacconists carrying Tesa in the future. Since I discovered them several years ago, Tesa’s various blends have been among my favorite cigars on the market, and also some of the highest-rated cigars at StogieGuys.com. Riverside will be carrying several of (what I consider to be) Tesa’s best smokes, including Vintage Especial, 312, and Picadura King. All are made at Tesa’s small factory in Estelí. Until now, these smokes could only be procured via a personal visit to Tesa’s shop, or by placing an online order at Tesa’s website. Self-described as “an Irish kid from the South Side of Chicago,” Chris Kelly is a young, atypical cigar maker who may be one of the most talented blenders in the industry. For a while now I’ve been saying Tesa is a company to watch given its tremendous quality of complex blends, consistency, and growth potential. Riverside Cigar Shop carrying Tesa is one small step towards realizing that potential. 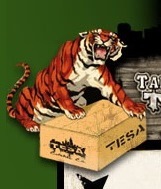 Tesa is a wonderful small company, owned by a world class family. I'm proud to call them my friends.